Professionally trained change agents have learned how to create crises and then propose a pre-planned solution. Ironically, some evangelical leaders have warned believers about these very tactics, particularly because it has been a common modus operandi of the political Left for a long time. Creating the crisis is done by things such as fomenting discord, agitating about issues, harping continually on what’s wrong, and even going so far as to create the actual problem. Often this is done via the media, which is a “partner” or “stakeholder” in the issue that is being drummed up. Once people accept that there is a problem/crisis, then the change agents come in with their pre-fabricated solution. This solution is usually onerous and intrusive, and in the political realm it usually means more government oversight and control with less personal freedom. Second, evangelicals are susceptible to prophecy-mongering because disaster is indeed imminent! We don’t know the day nor the hour (Matt. 24:36), but Jesus is going to return and before that happens Scripture states that things will wax worse and worse (2 Tim. 3:13). Believers are told to “discern the signs of the times” (Matt. 16:3). There are plenty of “wars and rumours of wars” (Mark 13:7) and many other things to indicate that the time is getting close. In fact, potential disasters are a dime a dozen. Every day brings hundreds of new catastrophic scenarios that loom on the horizon. The Christian Right gets all worked up about the environmental crisis advocates' claims of global warming, but they have their own calamitous commotions. Should Christians get all revved up about these things – even before they happen, IF they are going to happen? Jesus’s answer to this was very short and sweet: “see that ye be not troubled.” Why? Because “for all these things must come to pass, but the end is not yet” (Matt. 24:6). One of the more troubling aspects of prophecy-mongering is that those who are creating the crises are proposing solutions for the future. First of all, without engaging in a lot of semantic twisting and decoding of penumbras, these inventive crises can’t be found anywhere in Scripture. But, worse, their solutions can't be found in Scripture either. Their solutions often have to do with conducting spiritual warfare. Even real warfare. 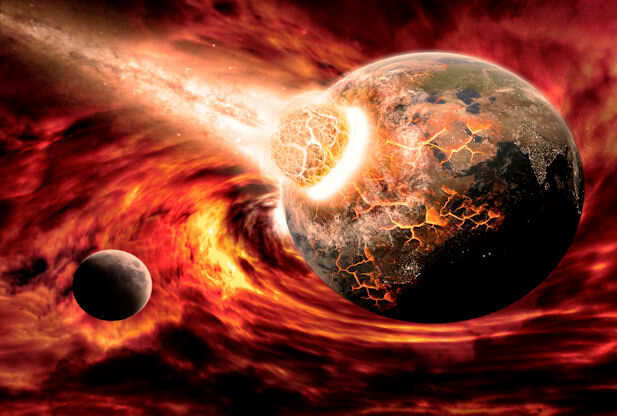 Some have twisted and distorted biblical eschatology into an endtime crisis that requires that the church defeat its enemies, subdue the earth, and restore paradise conditions. They teach that Jesus can’t come back until all of these other dreadful and scary extrabiblical things happen first – based on their own stories they made up, or extrapolated from occult sources. Question: since when is Satan a reliable expert about the endtimes? John 8:44 says that the devil is a liar and “there is no truth in him.” Yet these prophecy mongers rely heavily upon Satan's literature, and his dark imagery and falsehoods heavily pervade their crisis scenarios. 1. http://en.wikipedia.org/wiki/Chicken_Little Wikipedia asserts, “Versions of the story go back more than 25 centuries,” giving an indication of the timelessness of the gullibility of human nature. 3. Scripture warns that there will come a time when the false prophets cry "peace and safety!" (See 1 Thessalonians 5:3 and its last days context.) Possibly those who are preaching crises now will some day claim solutions – that they have attained “peace and safety” here on earth. Keep in mind the real biblical prophets lost everything, sometimes even their lives, calling the masses to repentance. They didn't get lucrative book deals, paid speaking engagements, keynotes on the conference circuit, and get on the fast track to “trusted experthood” – all of which seems to be the normal experience for modern prophecy mongers. 12. One is reminded of the addiction of the Athenians to the latest new things, of whom it is said they “spent their time in nothing else, but either to tell, or to hear some new thing” (Acts 17:21). that we may observe all the words of this law. As the Preacher has already told us, “There is nothing new under the sun.” (Ecc. 1:9) So why should we be surprised that yet another person has been the exclusive recipient of yet another “secret” from God and, for the first time in the history of the world, is making it known to us? For some reason, instead of writing it down in one of the original languages of the Bible and making it freely available to all like the original Prophets of old, this time around God chose to have it printed in English and sold for $16.99 ($9.00 on the Kindle). For a fee, the “prophet” will come and speak about it. False teaching disguised as “revelation” like Jonathan Cahn’s The Harbinger have been around since handwriting was invented and such will, no doubt, persist until the Lord returns. Please do not buy it or even bother reading a friend’s copy; why should you take away time from your personal meditation in Scripture, the only true source of revelation? But such things keep coming up, so I keep going back to the above verse. In addition to outright false teachers and false prophets who teach error, there are also those who, “…speak a vision of their own imagination, not from the mouth of the Lord.” (Jer. 23:16b) In either case, it is to be rejected just the same. The sad thing is that I cannot even report this to be the most egregious attempt to deceive the Elect in this age-old genre of claiming something never-before-revealed. There seems to be a whole “Bible codes” industry built on individuals and movements who purport to be the first ones in history whom God allowed to figure out these “secrets.” On the most shallow, surface level of this nonsense, why does it not bother anyone with a grade school education that the Lord has allowed all of the apostles, pastors and scholars throughout the whole of history up this point to have miscalculated, mistranslated, or just plain mishandled the Word except these chosen few whom God waited until now to reveal it to? Why is it that we so rarely see these “gifted” individuals living like a true apostle or prophet, much less a faithful rank-and-file believer? Why does God choose for them to personally profit so greatly from this particular revelation when this was anything but the case for those through whom the true, written Word of God was previously given? (Prophets from biblical times must be jealous of profits in modern times—pun intended.) Why should I even attempt a scriptural response when the argument is won and lost without ever leaving the arena of common sense? For the uninitiated, the name of the last book of the Bible, in Greek, is “Apokalypsis.” It describes an unveiling, something that becomes clearer and clearer as you get nearer to it, and the veil which you can already partially see through is finally lifted out of the way. The truth is that if we would just trust the timing and direction of the Holy Spirit through Whom we obtain the only guidance that can explain God’s Word, there are no remaining “secrets.” At present we can already see the outline of them all, so it is really a case of God’s timing as to when we will be brought close enough and the veil fully removed so that what has been there all along comes into our clear, earthly view. Such are not “secret” things, but a test of faith to see if we will obey all that we have already been given while we wait for His timing when it comes to the rest. Beware of those who claim they are the only ones who can explain what is behind the curtain, especially if it costs $16.99. But I have to say that it amazes me how poor the so-called “Christian” con-artists and counterfeiters are at their work! We could never find an unbelieving con-man or counterfeiter producing obvious imitations and cheap knock-offs that would not fool anyone. They have much more pride in their work than the Christian con-artists! The professional thief at least does their homework, pays attention to all the tiniest details and makes it the most difficult possible to see any difference between the fake and authentic. At least their fake diamond is so good, only the most well-equipped and knowledgeable expert can tell the difference so that they really do fool the mark. All Christian con-artists seem to need to do is produce something sparkly and pretty which only they would have the audacity to call a “diamond,” and there is no end of takers who are fooled! They do not have to make any effort whatsoever beyond simply calling it a “diamond” and, unlike a wiser person of the world, their marks simply take their word for it. Unlike the world’s counterfeits, it is so obviously something of little resemblance to the real thing that it should never have fooled anyone to begin with. Everyone then, just as today, knew that the Messiah was coming soon. The real prophet did not reveal a new “secret,” did not dazzle them with something only he had, but called them back to the most basic thing they knew all along because it had been drilled over and over again through all the previous prophets and God’s Word predicting His arrival: repent of sin and put the Word of God as already given into practice so you will be able to handle the coming revelation. I have seen people use Gematria, where the letters of the Greek or Hebrew alphabet are assigned a number, to show that the Messiah to come was going to literally be named “Jesus.” If that is true, it is not actually something “new” or in conflict with the rest of Scripture, is it? Scripture confirms that the Messiah is indeed named “Jesus.” Within Scripture is a rich texture of patterns, allegories, parables and typology, all of which never form the basis for doctrine, but in every instance is confirmed elsewhere in Scripture by what is plainly stated. The “deeper” things reflect and provide a better understanding of the basic things. If someone offers something that cannot be confirmed and supported by Scripture, run far, my friend… run fast. It will only come to those who are obediently putting His Word into practice for the purpose of their further putting His Word into practice! Biblically speaking, “those who fear Him” is defined as someone who is intimately acquainted and so reveres the Lord that it is visibly proven by their obedience to His Word. This verse does not contradict the one previously quoted from Deuteronomy, but establishes what we know not only about every biblical prophet’s ministry, but every sign and wonder recorded and still to come: it is always about obedience to the greater message of the Word. The Psalmist tells us that the end result is the deepest and most complete working of God’s Word, to “know His covenant.” This is the term which expresses having entered into a personal relationship with God based on the mutual terms of His Word. Authentic secrets from the Lord confirm His Word for those already in a right and obedient relationship in the most profound ways so that it has the greatest effect to reinforce obedience to His Word! Republished with permission of the author. Original published HERE. God began His written message, the Bible, by stating an extremely profound and essential truth. That fact and its importance are eloquently stated by Larry DeBruyn. At a point before time, nothing existed. By creating something out of nothing, the transcendent God Elohim began time, matter and space. Out of nothing He brought the material universe into existence (i.e., creatio ex nihilo). This simple yet profound statement regarding the subject of origins is foundational to everything else in the Bible. Not only is it important for us to understand the truth about Creation, that is, the origin of time, matter and space, it is just as important to understand the truth about what has happened since that beginning. What has been God’s role once He, Out of nothing… brought the material universe into existence? How has His creation continued to exist or, why has it not reverted back to the state of nothing? To answer those questions we only need to search the rest of Scripture, such as Colossians. That New Testament book is Paul’s letter to the church in Colossae, written while he was in a Roman prison. In the initial part of the first chapter he commends them for their faith in Christ and love for fellow believers and that he prayed for them ceaselessly so that they would, “…walk in a manner worthy of the Lord….” He then proceeded to write about the Christ who, “…delivered us from the domain of darkness…,” provided redemption and forgave sins, that He is God and was the, “…first-born of all creation.” That was followed by a rich statement about Christ’s power. The KJV uses “…by Him all things consist;” here and, both the ESV & NIV read the same as the NASB. to join together parts in a whole, to constitute, create, bring into existence, to exist. Another similar use of that word is found in 2 Peter. The KJV uses were of old and, both the ESV & NIV use existed here. The whole creation is kept together by the power of the son of God, and made to consist in its proper form. The next set of christological formulations (v. 17) repeats in chronological fashion the critical relationship between Lord Christ and all things. The previous confession stated that the destiny of all things is predicated by being in Christ. Similarly, if Christ was before all things, and if all things have their beginning by him and their purpose for him, and if in him all things hold together in a coherent and logical way, then the wise thing to do is to line up under the lordship of Christ in order to enter into God's salvation. After writing, “For by Him all things were created,” in vs. 16, Paul goes on to explain what “all things” includes with four phrases covering four different aspects: (1) “both in the heavens and on earth,” (2) “visible and invisible,” (3) “whether thrones or dominions or rulers or authorities,” and in vs. 17, (4) “He is before all things.” That includes everything in our space-time continuum and, before time even began. Christ created it all! The main focus of this essay is to bring some attention to the importance of what it means to us today that He is (still) holding all things together, by focusing on just one aspect of all things, that is, the physical parts of what He has created. While it could perhaps be argued that the spiritual parts of creation are more important than the physical, both are products of His work. God did not do His work of creation and then just let it go off on its own. He is still keeping it together and running as He designed it. Not only did He create the heavens and the earth, He has kept it in operation. Not only did He create man in His own image, He interacted with him after that and kept him alive. (Genesis 1:26-30; 3:9-13). Long before Paul addressed those Greek philosophers, the issues of life and its existence were of concern to man as illustrated by Job whose writings are considered the oldest in the Bible. Job both asked and answered the question about the control of all life. Does not the ear test words, as the palate tastes its food? Wisdom is with aged men, with long life is understanding. With Him are wisdom and might; to Him belong counsel and understanding. When seeking answers to such questions we should first remind ourselves of what Paul wrote to the believers in Corinth about the wisdom of men, something that is just as appropriate for today. What would happen to His creation if God withdrew His power from it? To answer that question an attempt will now be made to identify some of the consequences to life on earth as we know it if the Creator were to withdraw His power, that is, if He did not continue to hold all things together. The physical examples that follow are not intended to be exhaustive, but only to provide a sample out of all possibilities. In the very first verse of the Bible God tells us that He, “…created the heavens and the earth.” The remaining verses of that first chapter of Genesis present some of the details of Creation, that is, what He made. In terms of astronomical dimensions earth is a very small part of all He made. However, it is where He placed man, it is where He caused His written word to be produced, and where he sent his Son to die for the salvation of sinners. Therefore, an obvious place to start looking for of evidence of what would happen if God did not hold all things together is the place where we humans live. We will first give our attention to some physical aspects of earth and their impact upon the inhabitants of earth, that is, plants and animals. While the impact upon human life will also be touched upon in this section, the following section, Human Life, will address that in greater detail. Earth is tilted on its axis from perpendicular by about 23.5° and this tilting is the primary reason we have the four seasons each the year—spring, summer, fall and winter. The fact that the earth revolves around the sun also plays a role in giving us our seasons. Since the axis is tilted, different parts of the globe are oriented towards the sun at different times of the year. Summer is warmer than winter in each hemisphere because the rays of the sun hit the earth more directly and there are more daylight hours during summer than during winter. If the earth was not tilted at all, seasons would not change and each area of the earth would have the same season all year. The lack of seasonal change would have a severe and adverse impact upon plants, animals and man. For most plants, sunlight in the correct amount is necessary for growth; too much or too little and they will die. Without seasonal change some areas that now grow plants would no longer be able to do so and some types of plants would not grow due to too much light and heat. Such a situation would also negatively affect the animals and man who depend upon plants to sustain life. Sunlight and/or the absence of it also impacts weather (rain, snow, wind, temperature, air pressure) which in turn has an effect upon plants, animals and man. One very simple illustration of the impact of sunlight intensity is the need for yearly freezing temperatures in some areas to control insect infestations. If God’s power did not hold the earth’s tilt exactly as it is, life on earth would be quite different or even non-existent. The earth rotates on its axis approximately once every twenty-four hours and that gives us our days and nights. At the equator that is a speed of close to 1,040 miles per hour in a counterclockwise direction (when looking down from over the North Pole). This rotation also has an effect upon our weather systems as shown by the fact that in the Northern Hemisphere low pressure systems rotate counterclockwise while high pressure systems rotate clockwise. In the Southern Hemisphere the opposite is true. In addition, while the origin of earth’s magnetic field is not well understood, it is accepted that the earth’s rotation does contribute to its magnetic field along with the rotation of its internal core which does not quite match the overall earth rotation and, that in turn helps protect us from harmful radiation from the sun. If the earth did not rotate we would not have day and night as we now know it. With no rotation and continued revolution around the sun daylight and darkness would last six months esch. If the rotation speed was greater or less than it actually is the length of our days and nights would be very different. In either case the dire results should be quite obvious. If God’s power did not keep the earth’s rotation on its axis exactly as it is, life on earth would be quite different or even non-existent. The earth revolves around the sun once every 365.24 days in an elliptical orbit and this movement adds to the effect of the Earth’s tilt to give us our seasons. If the earth did not orbit around the sun where would it go, into outer space? How then would we get the sun’s energy that is so essential to life on earth? If God’s power did not keep the earth revolving around the sun in the exact path as it is now, life on earth would be quite different or even non-existent. Gravitation, or gravity, is a force that attracts physical bodies with a strength that is in proportion to their mass. Gravitation is the reason we have weight. It causes things to fall to the ground when dropped and without gravity we would float off into the atmosphere along with other things like, animals, rivers and lakes. It is also the reason liquids, including rivers, run down instead of up. Gravitation is the force that keeps the earth in its orbit around the sun and, for keeping the moon in its orbit around the earth. Gravity also is the force that keeps earth’s atmosphere in place and that in turn has an effect on how human bodies function as will be mentioned later in the section titled, Human Life. Specific examples will be given of what can happen to the human body when it is free from gravitational forces. If God’s power no longer maintained the forces of gravitation as they currently exist, life would be quite different or would cease to exist. Our planet is surrounded by a layer of gases, held in place by the force of gravity, called earth’s atmosphere, and it has everything needed to support life on earth. It is composed of: nitrogen (78%), oxygen (21%), argon (1%), and smaller amounts of carbon dioxide, neon, helium, methane, krypton, hydrogen, nitrous oxide, xenon, ozone, iodine, carbon monoxide, and ammonia. The lower altitudes also include various quantities of water vapor. The weight of the air surrounding earth exerts a pressure upon the earth’s surface and is called atmospheric or barometric pressure. At sea level that force or pressure averages around 14.4 lbs. per square inch. While temperature and moisture do affect the pressure, as the distance above sea level increases the pressure decreases. In fact, for every 1,000 feet of altitude the pressure decreases approximately 4%. The following table illustrates several examples of how atmospheric pressure decreases with an increase in altitude. Note: The summit of Mt. Everest is 29,035 feet above sea level. Atmospheric pressure also affects animals. For example, fish have a gas filled organ called a swim bladder which helps them with buoyancy compensation. Even the normal changes in atmospheric pressure at the earth’s surface can affect the catch rate of fish, let alone what would happen at extremely low pressure levels. Plants also depend upon having an appropriate atmospheric pressure for normal growth because the speed at which plants grow is affected by atmospheric pressure conditions. If the pressure goes too low, a plant cannot survive due to the lack of gas exchange that can take place. Weather is also affected by altitude (lower air pressure) because air temperature decreases as altitude increases. Ultimately it is God’s power that maintains our atmosphere at the level that sustains life on earth as we know it. All matter consists of particles called atoms and, the atom is a basic chemical building block of matter. Atoms are comprised of three main parts; protons, electrons and, neutrons. Protons and neutrons are found together in what is called the nucleus of the atom and the electrons circle or orbit around the nucleus somewhat like planets orbiting around their sun. Protons have a positive electrical charge, electrons have a negative electrical charge, while neutrons have no electrical charge. The particles within each atom are held together by powerful forces. Remember—God holds all things together! When atoms bond together, they can make larger building blocks of matter called molecules. When electrons are made to move from one atom to another an electrical current is created. Electricity is the flow of electrons. Since the earth is made of matter and matter consists of atoms and atoms have electrons, the earth has an electrical system. While the average person tends to think of electricity simply as something that goes through wires and makes our lights and television come work, or it is why lightening kills, electricity plays a much bigger role in earth. In addition to the fact that the atom, which contains electrons, is a basic chemical building block of matter, electricity is involved when plants move, such as, in the Venus flytrap and other carnivorous plants, electricity is involved when animals see and hear, electricity is involved in weather systems, watches are kept on time by the electrical properties of minerals such as quartz, etc. If God removed His power that holds atoms together, if He removed electricity energy, all life and matter would cease to exist. The main effect of the moon upon the earth is ocean tides, although if we had no moon nights would be darker and that would have an effect upon animals, especially nocturnal ones. There also are many life forms that depend upon the changing of tides. The fact that He holds together the position of the moon and that He maintains its gravity, is essential to life on earth! In addition to all of those matters is the issue of the necessity of God’s control of the rest of our universe and beyond, such as, the path of asteroids and other heavenly bodies! Electromagnetic radiation is a term used to describe the different kinds of energies radiated into space by stars such as the Sun. The electromagnetic spectrum is the range of all frequencies of electromagnetic radiation. At the lower end of the spectrum are radio waves and at the highest end are gamma rays. The kind of electromagnetic energy we use most often to live is visible light. Yes, light is a form of such energy. Examples of other kinds of this energy we use include radio waves, radar waves (microwaves) and X-rays, to name a few. At the same time such radiation can be dangerous to life, even deadly if not properly controlled. In fact, earth’s atmosphere that was discussed earlier, plays an important role in protecting us from the dangers of electromagnetic radiation. If God’s power, that both created and sustains electromagnetic radiation, was withdrawn life would cease. David stated an awesome truth when he penned the following words that are very appropriate to mention at this point. Truly our bodies are wonderful works! Take a look at some very interesting facts and be thankful that, like the earth, God also holds together our bodies. The wonderfully made human body, made by God, has a physical composition of many, many parts. At one level we could say it is a collection of cells, which are sometimes referred to as the body’s basic unit of life. How many cells does the human body have? There is no consensus about the number of cells in the human body other than that most scientific sources claim they number in the trillions. Cells consist of particles called atoms and as was mentioned earlier, atoms are a basic chemical building block of all matter, including human cells. The body is made up of many types of cells. These cells grow and divide in a controlled way to produce more cells as they are needed to keep the body healthy. When cells become old or damaged, they die and are replaced with new cells. However, sometimes this orderly process goes wrong. The genetic material (DNA) of a cell can become damaged or changed, producing mutations that affect normal cell growth and division. When this happens, cells do not die when they should and new cells form when the body does not need them. The extra cells may form a mass of tissue called a tumor. If God suspended the forces he used in Creation, the entire universe would disintegrate. Earlier, the importance to earth of gravitation was discussed. Now, take a look at some facts about its importance to our bodies. Man’s travels in space, including to the moon, took the astronauts away from the full force of earth’s gravitation into what is sometimes called microgravity. Those activities have already revealed that less gravity does impact our human bodies. Following is a specific example. In December 2011, U.S. astronaut Don Pettit launched from Kazakhstan in a Russian Soyuz space capsule and arrived at the International Space Station, where he spent the next 191 days. While there, Pettit orbite4d the Earth 3,088 times and witnessed the arrival of the SpaceX Dragon, the first commercial craft to dock at the ISS. He also experienced significant physiological changes. Extended periods of low gravity lead to bone density loss and heart shrinkage. When Pettit returned to Earth in July, his body could not endure even minor physical exertion in normal gravity, so the ground crew carried him to a nearby medical tent for routine post-spaceflight examinations. Research has shown that astronauts’ muscle tone improves after a few weeks, but their bone density may never return to pre-spaceflight levels. While some of the effects of weightlessness have already been identified, enough is known to suggest that we do not yet know enough. NASA and its fourteen international partners will be doing more research on the effects of long-term spaceflight on the human body in the International Space Station. Our bodies are designed to take care of the earth’s gravitational effects upon the fluids within us. When that force is present to a much lesser degree it can result in stuffy noses, headaches and, puffy faces. Bone calcium and phosphorous are excessively excreted in body waste during weightlessness which can result in bone loss, urinary stones and bone fracture. When a spacecraft is in orbit the muscles of astronauts weaken. At least sixty percent of astronauts experienced symptoms of motion sickness after being weightless. Red blood cells transform into a different shape during long-term space missions. While in space bodies are subject to more space radiation because they are less protected from such by earth’s atmosphere and magnetic field. The importance to earth of its atmospheric pressure was also discussed earlier. Now let’s look at the importance to human bodies. Astronauts work in dangerous environments and face many possible dangers, one of which is a punctured space suit. Not only would the loss of oxygen be deadly but the loss of atmospheric pressure would cause the body’s water to vaporize and to try to escape, the lugs would collapse and circulation would shut down. Pilots can experience the same physical reactions by flying up into the thin air at high altitudes. U-2 pilots are especially at risk, not just because of their extreme altitude but also because their cockpits are only partially pressurized. The pressure in a U-2 cockpit at typical mission altitude is equivalent to the atmosphere at 29,000 feet—as high as the summit of Mt. Everest.” Before 2002 no cases of altitude-induced decompression sickness severe enough to hinder U-2 operations were reported. However, that has changed due to the pilots flying more often, longer flights, and a change in work activities while flying. The loss of sufficient atmospheric pressure by U-2 pilots has resulted in symptoms such as: itchy skin dots caused by capillaries breaking under the strain of nitrogen bubbles, severe knee pain, headaches, nausea, extreme fatigue, hallucination, long lasting or permanent brain damage, and blacking out while flying. The situations cited in this essay are just a small sample of how important is the truth described in by Paul in Colossians 1:16-17. The Complete Word Study Dictionary, New Testament, Spiros Zodhiates, AMG Publishers, Chattanooga, 1994. Matthew Henry’s Commentary, In One Volume, Leslie Church, Ed., Zondervan, 1961. IVP New Testament Commentary Series, Grant R. Osborne, Ed., Inter Varsity Press, Downloaded from www.biblegateway.com. Popular Science, November 2012, p. 10. Popular Science, November 2012, p. 55. Air & Space, April/May 2012, “Killer at 70,000 Feet,” p. 42-47.